Both cards are absolute;y fabulous as always. I love your coloring using any medium. I have fallen in love with that cute little bear. Thank you. You are awesome. Love the knit look of the monkey..and the bear has so much going on. Love both cards, Sandy! I have a real weakness for scenes on cards, so the bear card is my favourite. Super cute cards! Your coloring is alway so inspiring! Thanks for the inspiration. Love the Essentials by Ellen stamp sets! Your cards came out great! Thanks for the chance to win one, I got my eye on the Pineapple! Such cute cards. I would love to win a stamp set. They are so much fun. Wow…what fantastic cards! 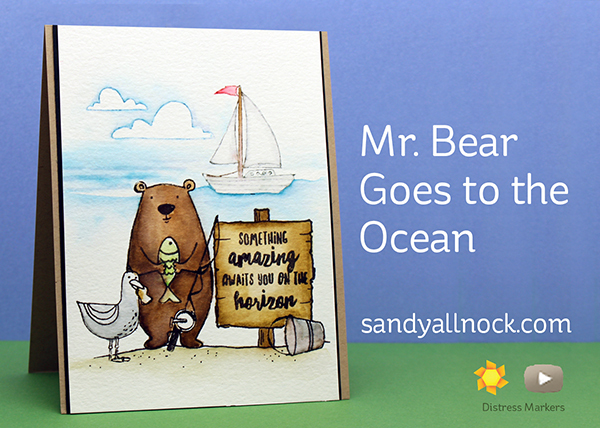 That sock monkey and bunny are adorable, and the bear and seagull on the beach are so fun. Your coloring and all the card details are fabulous! Eeekkkk!!! Look at these cute little scenes! Love them! Wow! I love these cards! Thanks for sharing some cool coloring techniques. I always seem to learn so much from your videos! Both of your cards are so very cute. A bear on the beach –I love it! and the “knitted” critters look so realistic. I love that bear at the ocean scene! Both cards are awesome! I adore sock monkeys and you did such a wonderful job with this one. The texture technique is fun since the socks that are used to make the sock monkeys have so much so much of it! Well done as usual tfs. You really socked it to those cards! Fabulous ! Love the tutorials too ! Sandy you never cease to amaze and inspire! Love you cards. Cool cards. You’re so good at building scenes and coloring! AWESOME cards, thanks so much for your awesome videos! Great release & hop! I am so loving that bear stamp. Love what you did with it! Wow they are adorable, especially that sock monkey! Super cute cards and beautiful colouring!!! Thanks for the great card inspirations! And thanks to Ellen Hutson for the giveaway! Thanks for the coloring tips. Your cards are great! Keep those distress markers out! You do beautiful creations. I look at your great designs- and think, I doubt I could do that! Then I read your positive directions, and say why not!! Thank you for sharing your talents! Wow… what an amazing job… You definetly make these sets shine. Thanks for showcasing them with your talent. I love watching you color. I have learned so much from your videos. My cards have gotten remarkably better since I found you. Love the clouds in the bear scene. Both of your cards are amazing Sandy and I loved you videos, I always learn something new from you so thank you! Love both of your cards and your coloring. They are cute. 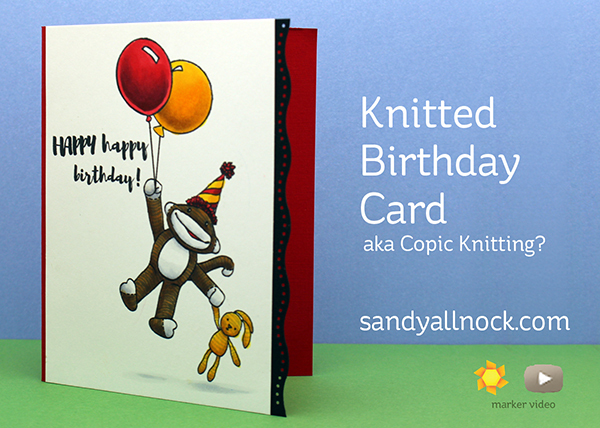 Two totally adorable and fun cards, Sandy! I’m glad the sock monkey has so many options of things he can hold. I like the scene you created for the bear beach bum. I love the Salty Sea stamp. Wow- love the scenes you created for your cards. Mr. Bear Goes to the Ocean is so detailed- well done. Love your use of combining stamp collections! Adorable monkey! LOVE Mr Bear’s BEAUTIFUL beach adventure, ADORE your SUPER CUTE sock monkey – WOW – it is FILLED with STITCHES of INKY AWESOMENESS – LOVE IT ALL!!! THANK YOU for sharing your CREATIVE INSPIRATION and AMAZING colouring!!! Those cards just knock my sock monkey’s off…haha! Love your adorable designs.